Kate Middleton and Prince William are back in the spotlight once more, doing their bit for the nation and cheering on Team GB at the London Olympics. More than a year on from their royal wedding, how have the sports-loving pair settled into being husband and wife? With the help of professional body language expert Elizabeth Kuhnke, author of Body Language for Dummies, Stylist examines how the royal duo handle the enormous pressure of being in the limelight - from Olympic stadium to royal tour. Are they taking it in their stride or is the strain starting to show? Find out with our body language analysis below. Beaming smiles and sparkling eyes show that Catherine and William are very much enjoying the Olympic action - but their close physicality, with both arms wrapped around the other, indicates that they love and enjoy each others company more. This pose is natural and spontaneous and shows true love and affection. As is frequently the case, Catherine is standing slightly ahead of William, this time enabling him to place his right hand on her lower back as he guides her into position. Both seem somewhat nervous – he with his left arm crossing his body and fingers slightly rounded in a closed position – and her with her left hand elevated as if to keep harm at bay. Both of them have their weight on their inside legs, putting their bodies in close proximity. The expression on her face is concerned while he seems to be contained. In this photo William and Catherine look natural and spontaneous. Their beaming smiles and close physicality indicate their love and enjoyment of one another’s company. Pressing their bodies next to one another along the length of their torsos, with William’s hip literally pushing into her, their affection and passion is palpable. As he embraces her and she spreads her left hand across his chest, it’s clear that these two are protective and possessive of each other. William offers his bride a gentle and caring hand placed attentively on her waist as he helps her board the float plane. As always, their bodies are close together, a further reminder of their physical comfort with one another. The stiffness in Catherine’s upper body, her open mouth and spread fingered hand indicate that she is less sure of herself than William who comes across as an old hand at matters concerning air and sea vessels. 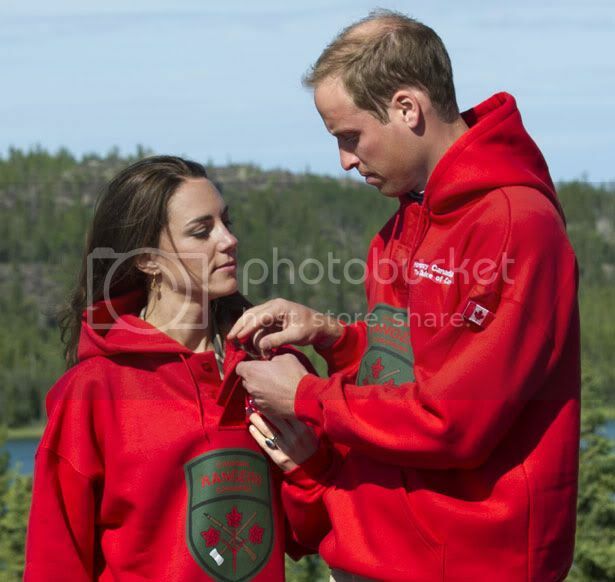 Here, the normally capable and confident Kate allows the prince to look after her attire, while she reaches up with her left hand to lend a little support. William seems particularly solicitous and engrossed in looking after his wife, focusing on what he’s doing. Catherine’s left arm is touching William’s right side, and her open upper torso signals her physical affection and confident sexuality. In this photo William looks slightly hesitant as can be seen in the way he’s fiddling with his fingers – one of the signature poses the prince adopts when he’s uncomfortable. He also seems to be slightly blinded by the sun, causing him to squint. Standing slightly in front of the prince, Catherine’s continues to wow the crowds with her radiant smile and open palm wave. Her clutch bag is a handy prop and gives her something to hold onto to steady any nerves. Kate and William aren’t afraid to demonstrate their affection in public. While they may have been invited to press the red button together, it’s clear by their open smiles, the way they’re tilting their shoulders towards one another and the easy way her hand rests on his that they’re physically comfortable and confident together. Although they’re looking in different directions, their heads and torsos are matched – both facing forward – enabling them, as a couple, to include the whole crowd as one entity. Engaged and open to the crowd as can be seen in their forward facing bodies, her left arm, slightly crossing her body, provides her with a bit of protection as well as offering an excellent view of her engagement ring. Cheeky grins or secretive smiles – call them what you will. William looks like he’s whispering a secret suggestion that has the Duchess ready to burst out laughing as she affectionately strokes his shoulder. Their sparkling eyes plus the angle and forward movement of their bodies further indicates how connected they are to one another.